Strong winds whipped through Arlington's entertainment district early Tuesday evening. The National Weather Service estimates a microburst with winds between 60 mph and 70 mph caused damage in Arlington and Grand Prairie. 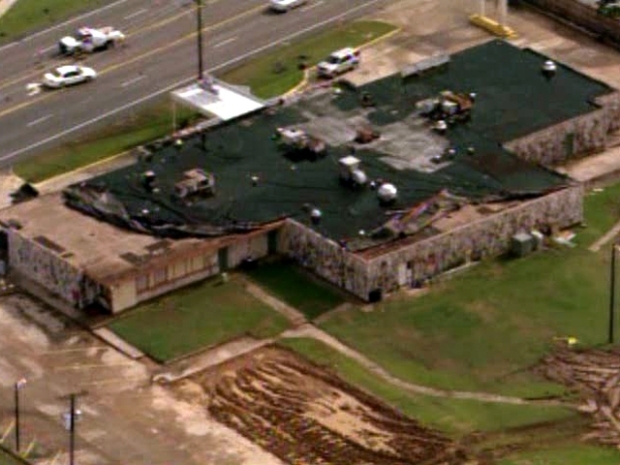 The powerful winds ripped off the roof off an old motel building near State Highway 360 and Division Street and blew the debris into the road. The motel was in the process of being torn down. Traffic was rerouted for a short time while the road was cleared. Strong winds in Arlington blew over trees and tractor-trailers and ripped off a roof. The damage from the storm was concentrated between Interstate 30 and Division Street and Highway 360 and Collins Street. The strong winds came after a cell over Arlington abruptly dissipated, NBC DFW meteorologist David Finfrock said. As it fell apart, the area saw some strong, down-burst winds. In Grand Prairie, high winds damaged the outer walls of a warehouse and to the roof and signs of businesses in the area of Highway 360 and North Carrier Parkway. The National Weather Service said power poles near the Rangers Ballpark in Arlington were also leaning. The ballpark had some minor damage from the storm, the team said. There was some tree damage outside the ballpark, and some outfield windscreens and sheet metal on the roof had minor damage. The damage will not affect Tuesday night's game against the Cleveland Indians. Fans were already arriving for the game less than an hour after the storm blew through. The Rangers said two parking lot employees were transported to a local hospital but are not believed to be seriously injured. Three other employees were treated at the scene. Tree limbs littered the area around the Road to Six Flags. 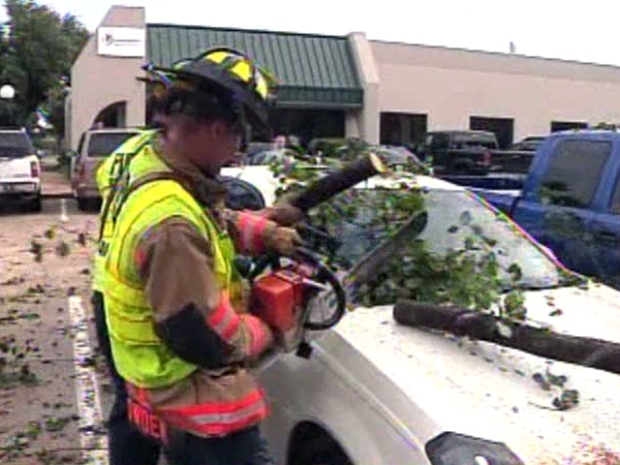 The strong wind gusts also blew down an oak tree onto a car and pickup truck in a parking lot.